So, the idea was to catch my two Israeli friends for Oktoberfest in Munich going south from Milan to Switzerland, crossing the Alps through San Bernardino tunnel, then a piece of Austria (Korridorvignette) and then over Bavaria Autobahns to Munich or 70km north from it to be more precise. It did seem a pleasant journey on the map full of enjoyable views and famous German roads. Maybe with one small underestimation. When saying “end of September” in northern Italy, leaves of all kind of fire colors, warm weather, not too much rain are the things that usually come to mind. Well, it is different in Germany let alone Alps. And like this wasn’t enough, there was an unusual large amount of water coming down from skies. Forget forecasts, these are all lies. But step-by-step we go. The most beautiful part of the road starts right when you pass Como lake towards the Lugano board crossing, the fresh mountain air is washing your face and you enjoy the view. Wasn’t that much of the latest all covered with some clouds but alright, wasn’t the first time there so skipped to the border to buy the Swiss highway pass. That goes at €33 (CHF40) (on the Italian side, in a bar) for 12+1 month but with some dirty trick, if you buy it in September then you will have 12+1-9 since it is bound to the specific year. Then you go straight towards Lugano passing by the lake and then towards Bellinzona and to the 13th road where the enjoyable views start to become breathtaking. The most of the fun starts when you start to climb up the mountains on a curvy road which is both mountain like and wide enough for 4 lanes. Not much of adrenalin but a lot of views again. Though that was the first time I’ve seen a sign showing a semi trailer with burning wheel. Should obviously mean something. After some curves and tunnels arriving to the San Bernardino tunnel entrance. Freezing already with all my summer outfit and “breathing” gloves. Here you have a good opportunity to visit the marvelous Kiosk with toilets. Enter the tunnel and get some boring 6.6km at 80kmph. Getting out gives another strike of cold after the relatively warm air in the tunnel and steals your breath again with the panoramic view. Again curvy road this time downhill till the Splügen and then to the Sufner Sea where you can say good bye to the high mountains and continue straight on the road 13 that goes through green valleys along a river towards the St. Gallen. Nice experience too though nothing of extreme there. 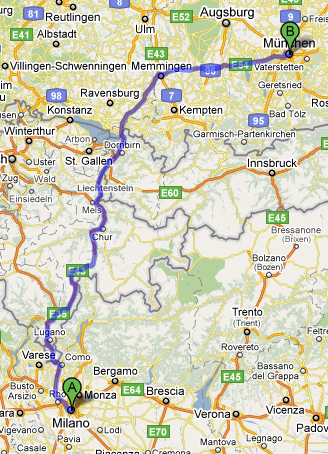 To catch up with my friends for the lunch I’ve exited the 13th towards A14 and crossed the Austrian border in Mäder. There you basically have to buy some road ticket I’ve heard costs €7.7 for a day or something. But there was no sign of “vignette” so I didn’t insist and just got in. Another dozen of kms in Österreich and stopped for lunch in a small town Hohenems stuck under an Alps mountain. Met my Israeli friends, ate some “chicken salad” enjoying the Alpine cows passing right near the place and then back to road. Just as soon as we’ve got to the highway we were welcomed by a traffic jam. It was Friday around 4.30pm so I believe the habit of finishing the work earlier on Fridays is very common in Austria as in all the countries I’ve been to. We’ve got out of the highway and made some kind of 1 hour “shortcut” through the countryside and crossed the German border at some point. Dunno where and how we’ve got back to the highway towards Munich since my GPS got out of juice as well as all my juice loading devices have failed me. So I’ve been just following my friends car and wondered around. That was the first Autobahn I was riding on and it did feel great even if it was only two lanes wide and with 120kmph speed limit but the quality of the asphalt and its straightness did provide some impression. Needless to say that when we’ve finally got to the place I was literally full of water I could squeeze out in liters. The place itself was a challenge to find. 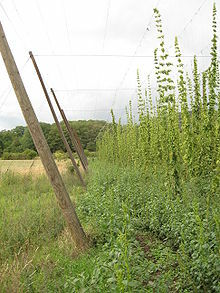 Hidden in harvested hop fields and wet spruce woods. Impossible to find at rainy night unless you go and ask locals. But finally we’ve got to the place. Very nice one anyway if you have time and wheels to travel 60kms north from Munich. Next morning we went to Munich to see the city center and the Oktoberfest. Not much to tell. If you have seen large European cities I doubt you will find something new in Munich but YMMV since I’ve been there just one day. There surely have to be some specific attractions but we mostly didn’t care  Got to see the central square and the cathedral but that was more or less enough so we headed to the Oktoberfest place. Well… i was disappointed actually. May be I’m just not up to noisy parties anymore or it was the doubled price of the beer. Or maybe waiting 30 minutes to enter a tent. Something actually has ruined the expected result of visiting it. Probably it has become such a touristic attraction that it has lost the spirit. Dunno. Some local fairs in other cities are much more full of it. Anyway, been there, got some beer, würstl and petzel. Seems enough to me and don’t plan to visit it again. So we’ve spent there the day and drove out from Munich stopping in some town and having a dinner in a non touristic place. Impressed by the service, quality and quantity of dishes with “schweine” in their names. Back to hotel with some good bottled beer as a lullaby. Next day was a relaxing one. Mostly on the back seat of the car watching countryside (which is a different story about farmers with Carrera parked in front of cowshed, houses all of the same color and solar panels on the red tiled roofs) between Augsburg and Freising where we had a lunch in the Weihenstephan Brewery (The World’s oldest continuously operating brewery) which had effectively canceled the dinner with a mixed pork plate. Nice place to visit if you happen around though we couldn’t get into the brewery itself since it was Sunday so check tours schedule if you plan to visit. The night was spent in Nuremberg which compared to Munich has kept much more of the medieval atmosphere. Walking in the pedestrian areas of the old city all mixed up with old houses and new shops doesn’t really create a feeling of dirt and mess as it does in most big touristic cities. And the view from the Kaiserburg is just like a picture I’ve had in mind in my 15 while reading adventure and fantasy books  So don’t miss it too if you are in Bavaria. Next morning I was back in saddle at 8:45am and headed directly towards Milano planning not to stop except for the gas until I get home. So these had to be 6hrs/548km ride. Checking the weather forecasts did give some expectation of rain in the southern part of the journey but at that hours the temperature was already at +8C and I was stupid enough not to take even some gloves to keep the hands worm. So I’ve stopped first after 70km already with some “freshness” feeling. Fortunatelly there was some sun coming out and things got better. Met some Italian guys in a camper there to discover that the most of the Oktoberfest for them are the German girls  “Ragazze tedesche”. Then back to the road which after some excitement of being constantly overtaken at 150kmph and of the politeness of the drivers that let you overtake at lower speed even before your turn-light starts blinking, the road gets boring, go at 150kmph until you have to overtake a truck that goes at 110kpmh, back to right lane to let 5 BMW to pass, next truck. 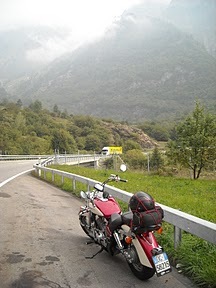 Arriving to the Austrian border, this time an highway crossing, where I’ve met an Estonian couple on a bike who where going to get into mountain peaks which from the bottom where all covered with suspicious clouds. So we both bought that €2 Korridorvignette tickets and got through. They turned to Austrian Alps and me to the Swiss. Like 30km from the border until it started to rain and I’ve had to stop under some bridge to wear the ridiculous waterproof stuff I’ve had with me. Though the rain didn’t last for long and it was of tolerable quantity. The things got worse when the road started to go uphill. I’ve had the thin leather gloves wet and my hands was the first to react to +5C mountain temperature. So I’ve started to stop periodically and got pretty warned when I saw snow in mountains which wasn’t there on my way north. At some point I’ve got a rather good idea to stop in some village and buy myself a pair of ski gloves just to be sure I can still clutch and brake in the mountains. Though they still had all the season shops closed and I went further hoping for the best. The positive part was to see the expressions on the faces of other bikers (mostly bmw gs or similar) all in fur and serious, overtaking me. A couple even seemed to offer some help  Anyway, all could be worse, a bit frozen I’ve got to the San Bernardino without accidents and enjoyed the worm air of the tunnel. Got to the other side and it seemed like coming back to summer, eventually the cold air just didn’t do that over the peaks. So after some 50km towards Belinzona I’ve started to catch strange sights from riders that didn’t understand what I am doing dressed like that in a shiny 25C day.